Home > News > General News > Senna at Suzuka: Time For Tea? Senna at Suzuka: Time For Tea? The Japanese fascination with the motor racing phenomenon that was Ayrton Senna shows no sign of abating. 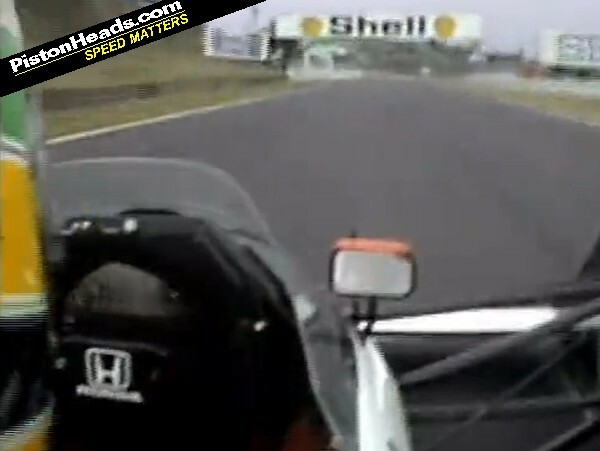 Here's a 'lap of Suzuka' that Honda put together based on the actual telemetry of Senna's 1989 McLaren. You'll understand why we've put that in speech marks when you watch it. Now, we like a fantasy vid as much as the next website, and you have to admire the effort and huge expense that's doubtless gone into this one. But it's hard to ignore a sense of anti-climax at the end, the sneaking feeling that 'effort in' hasn't quite translated into 'enjoyment out'. There'll be an equation for it, most likely, one that you could probably also use to calculate the fun factor of a Benelux domino-toppling event. Maybe we're being unfair. Maybe it was amazing if you were there, as a real person rather than a gurning extra. But even then, does it really compare to the original in-car footage of the man himself hauling the legendary MP4/5 around Suzuka at frankly ridiculous speeds? This vid is well known to PHers, but in case you're seeing it here for the first time, do not adjust your monitors: he really is going that fast. 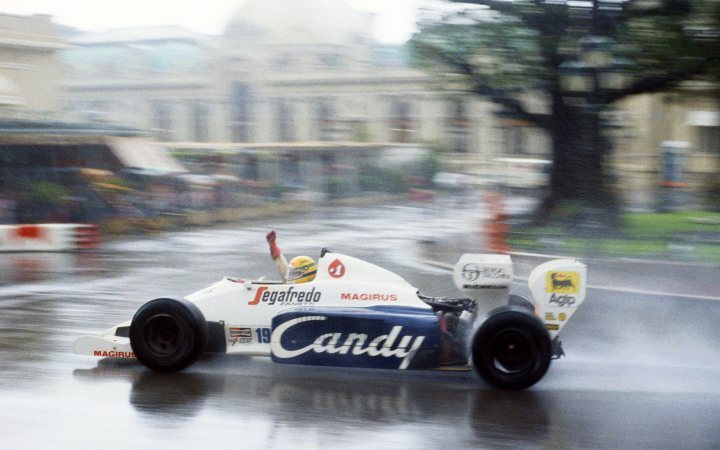 Senna's ability to drive on the edge, steering through some of the highest-G corners in F1 racing with one hand while executing lightning gearchanges with the other, was nothing short of freakish. And, as Senna's regular mirror checks indicate, he wasn't the only one performing at a superhuman level in F1 cockpits back then. Admittedly, the Brazilian finished his pole-setting quali lap a yawning 1.5 seconds quicker than second-place McLaren teammate Prost, so by any standards Ayrton was something special, but his fellow drivers were all putting themselves through the same wringer. The physical stress of driving a manual F1 car over the full 53-lap GP must have been immense. How did they do it? As that well-known paragon of physical fitness James Hunt drily noted at the 1990 Mexican GP, "if you want to know what 4.7 G is, just imagine yourself lying on the floor with 3.7 Nigel Mansells on top of you." What happened in the actual '89 Japanese GP is now part of racing folklore. From the start, Prost got the jump on Senna. Senna eventually caught the Professor, leading to a controversial crash which took the pair of them off. Prost retired, but Senna got back going with the help of some marshalls. He then drove like a banshee to catch and pass the new leader, Nannini, and take the chequered flag. Sadly, he was disqualified on what was perceived by Senna, Ron Dennis and quite a few others as an irrelevant technicality. Prost went on to win the '89 Drivers' Championship. Honda's phantom lap was one of those ideas that would have sounded great in an executive karaoke bar in Roppongi after the fifth or sixth Johnny Walker, but whether it should have gone any further than that, we'll leave you to judge. OK everyone, that's a wrap. Er, can someone clear up please? Thanks. See the 'Ghost lap' here. And the original qualifying here. Not too sure on that vid but the original is superb. Was this video not 'doing the rounds' last year? Car sounds really good in the real video. drag F1 back to the 80's by the scruff of it's neck.